1. Heat the oven to 200°C, gas mark 6. Open out the pastry sheet and cut into 3 even-sized rectangles. Crumble half the Flake over 1 rectangle then place another on top. Crumble over the remaining Flake then top with the third piece of pastry. 2. On a lightly floured surface gently roll out the pastry (the chocolate will break through a little as you roll) to make a rectangle, roughly measuring 15cm x 30cm. Using a small sharp knife, cut out 2 large heart shapes – don’t worry if they’re a little uneven. 3. Lift the hearts onto a non-stick baking sheet. Brush with a little milk and bake for 15 minutes until puffed and golden. Leave to cool. Store in an airtight container if making more than a few hours in advance. 4. Transfer the hearts to a serving plate. Warm the chocolate sauce in the microwave for a few seconds according to the label instructions. 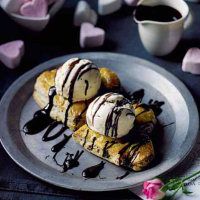 Top each heart with a scoop of ice cream, drizzle over the warm chocolate sauce and serve. If you want your heart shapes to be identical, you could make a paper template to cut round. To serve the tarts warm, cut out the pastry hearts, place on the baking sheet, cover with plastic wrap and chill until ready to bake.